This is a newly revised version of my low-fat vegan mayo recipe that appears in several of my cookbooks including my newest one, "World Vegan Feast", and elsewhere on this blog. I have used, and refined, this recipe for years because I am a mayonnaise lover. When I use it, I like to slather it on liberally! Hence, my preoccupation with a very lowfat vegan version of it that comes up to my taste standards. Of course, as a baby vegan, I tried those recipes where you blended a stream of oil into some soymilk (which contains lecithin, an emulsifier, as egg yolks do). They usually worked well, but were just as high in fat and calories as the original. So, for years I made tofu mayonnaise, and I still like it, but my husband never really did, and silken tofu, the main ingredient, makes it more expensive. We both prefer this recipe, and it is very inexpensive. Four Hellman's fans of my acquaintance loved this (and were surprised that they did). It’s smooth and creamy, and just tangy enough. This recipe is a child of an old-fashioned salad dressing recipe, called a "Boiled Dressing" (a bit of a misnomer, since it was actually cooked gently in the top of a double boiler). "Boiled Dressing" was made with ingredients available to common people or farm folks, who did not have access to, or could not afford, vegetable oil. Olive oil was not available to any but the wealthy until the late 19th century, so only they could enjoy vinaigrette and oil-based mayonnaise. 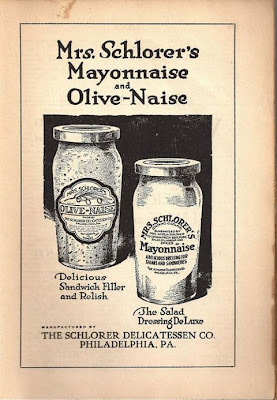 Oil-based mayonnaise was not available commercially in the USA until 1907, when Mrs. Schlorer's mayonnaise hit the shelves in Philadelphia. I looked it up and it is still available! Hellman's followed in 1912. You will find recipes for "Boiled dressing" or "Cooked Salad Dressing" in early North American cookbooks, and in some Southern and Mid-Western cookbooks. 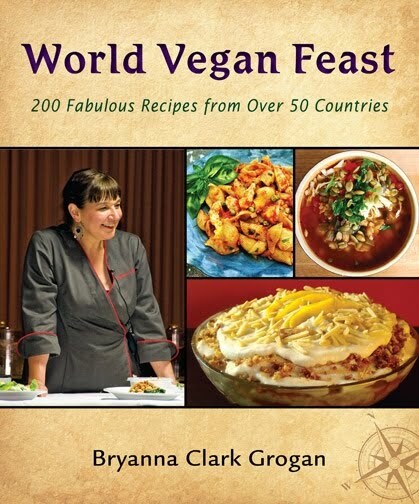 I started out by veganizing a recipe in a Mennonite cookbook called the "More-with-Less Cookbook" (first published in 1979), and refined it over time. It worked beautifully-- beyond my expectations, actually. It is very creamy and I didn't even have to add the tiny bit of guar or xanthan gum that I usually do as a stabilizer when I use oil. (It has held up well in the refrigerator for about a week and a half so far. Without the vegetable gum, the oil version tends to get a bit runny after a while.) I will make it this way from now on, unless I run out of raw cashews! For those who are allergic to soy, prefer not to use oil, do not like tofu mayonnaise, or the commercial "light" mayos (most are not vegan, anyway), this is a delicious (and inexpensive) solution. For those allergic to corn and or gluten: It's harder to find than other starches, but wheat starch can be used like cornstarch more easily (tsp. for tsp.) than, say, arrowroot, which I have never had success with. Wheat starch is easily available from amazon.com and it is gluten-free! (See http://www.glutenfreeliving.com/gluten-free-foods/ingredients/new-word-on-wheat-starch/ ) I have also purchased it in Asian food stores and the International sections of some supermarkets. Food Scientist Shirley O. Corriher (who I will mention more about below) says: "Asian grocery stores are a great place to buy starches. They have arrowroot, potato starch, rice starch, tapioca starch (a powder), wheat starch, etc. at a fraction of their cost in regular stores." With some of them, you use a bit more or a bit less, and some must be cooked longer, etc. So, you will have to do some experimenting. Personally, in the past I experimented with arrowroot (not in this recipe, though) and it didn't work for me, but many people use it. You never know til you try! I experimented quite a bit over the years with this mayo recipe and I definitely recommend corn or wheat starch for best results. There are about 90 calories in a tablespoon of regular non-vegan mayo and also in Vegenaise Original or Earth Balance Mindful Mayo. There are 45 calories per tablespoon in Vegenaise Reduced-Fat, 35 in Spectrum Eggless Light Canola Mayo, but only 12 calories per tablespoon in this mayo-- so you can indulge yourself! NOTE: This was calculated using my homemade soymilk, but I calculated it (with Living Cookbook software) using various nondairy milks and they were all in this range. NOTE: Low-cost, nut-free options-- unsalted dry-roasted peanuts (a legume), shelled raw sunflower seeds (soaked in boiling water for 5 minutes and drained), or raw sesame seeds, or a combo. I like half dry-roasted peanuts and half shelled raw sunflower seeds. NOTE: If the cooled-off mayo seems too thick or stiff to you, beat it with a whisk (you can do it right in the jar if you have a whisk that fits) until creamy. If you cut down the amount of cornstarch, it gets a bit runny after a week or so. The whisking method works for me-- it stays creamy but thick. NOTE BEFORE YOU START: This mayo does not thicken as you blend it, like egg mayonnaise or soy mayonnaise made with lots of oil, so don’t blend it and blend it, thinking it will thicken as it blends-- it won’t!! It will thicken in a few hours in the refrigerator. Place the Mix A ingredients into your blender jar and have ready. In a small saucepan or microwave-proof bowl, mix together the water and agar from Mix B, and let sit for a few of minutes. Add the starch and whisk well. If making in the saucepan on the stovetop, stir constantly over high heat until thick and translucent-- not chalky white. OR: Microwave option (my preference): Use the microwave-proof bowl for the mixture, and microwave on 100% power for 30 seconds. Whisk. Repeat this about three times, or until thick and translucent/semitransparent- not chalky white, even if this takes more than four 30-second intervals in the microwave. Use a silicone spatula instead of a whisk after the first time, to scrape the bottom of the bowl of any starch that gets stuck and mix it in with the rest of the mixture. NOTE: If you don't cook this thoroughly (and "translucent" is the key word), the mayo won't thicken properly. Pour the mayo into a clean pint (2 cup) jar (there may be a little bit over, which you can pour into a tiny jar or sample cup), cover and refrigerate for several hours, until it is set. It should be firm enough to stand a knife up in. Keep refrigerated. It will keep for about 2 weeks. MISO MAYO VARIATION: Omit the salt and add 3 tablespoons white miso. ROASTED GARLIC MAYO VARIATION: At the end of blending, add 1 head of roasted garlic, squeezed out of the skins. Use 3/4 to 1 teaspoon mustard powder and add 1 tablespoon lemon juice and 1 tablespoon organic sugar or agave nectar to the recipe (sugar levels in this type of recipe vary, so start with this and then let your taste dictate). For more variations see this blog post. Nutrition (per tablespoon): 12.0 calories; 42% calories from fat; 0.6g total fat; 0.0mg cholesterol; 92.6mg sodium; 9.1mg potassium; 1.4g carbohydrates; 0.1g fiber; 0.2g sugar; 1.4g net carbs; 0.4g protein; 0.3 points. 1.) This mayonnaise, with the addition of herbs, garlic, etc., can be used as a savory vegetable and toast topping. 2.) If you leave out the agar in the basic recipe, this makes a good base for cold savory sauces. I tend to use mostly raw shelled sunflower seeds, sesame seeds and dry-roasted, unsalted peanuts now for creamy mixtures-- they are all about $10 a lb. cheaper than cashews. These patties are a variation of an old recipe I hadn't made for a long time-- a vegan "chicken" spinach loaf. They are unabashedly NOT soy or gluten-free! But they have a homey feel, good flavor and texture, and they are so simple that the seasoning is open to interpretation. The loaf was made with the usual "chickeny" herbs-- sage, thyme, rosemary marjoram-- but I used a bit of a Middle Eastern theme with cumin, mint and basil the last time I made them. They could be made quite spicy, either by adding hot sauce, or using a spicy sauce on top of them. Or they could be made with Asian flavors-- lemongrass and cilantro, maybe, or 5-spice powder. You could also, I think, use other vegetables-- kale, chard, zucchini shreds (make sure these are well-squeezed), for instance. you could use green onions instead of white onion. I think you get the idea-- this recipe is a good one to play around with, so have fun! Heat the first the oil in a nonstick, cast iron or hard-anodized skillet and sauté the onion over medium-high heat until softened. Mix the bouillon with the boiling water. Add to the TVP and let sit 10 minutes. Preheat oven to 350 degrees F.
Mash the drained tofu and mix well with the squeezed spinach, cooked onions, soaked TVP and remaining ingredients, except the gluten flour. Mix thoroughly. Add the gluten and mix well again. Scoop up some of the “dough” and roll into a ball, then press down into a patty on a piece of baking parchment. You can make small patties, thin patties, thick patties— whatever you like. This recipe makes quite a few, about 18 normal-sized patties, depending on how thick you like them. Place the patties on parchment-lined baking sheets, cover with foil and bake for 20 minutes. Cool thoroughly in the refrigerator, then layer in a rigid storage container with parchment in between the patties and refrigerate, or freeze for future use. When ready to serve, brown them on both sides at medium heat in a lightly-oiled nonstick, cast iron or hard-anodized skillet. Serve in buns with your favorite condiments, or by themselves with a favorite sauce or gravy. 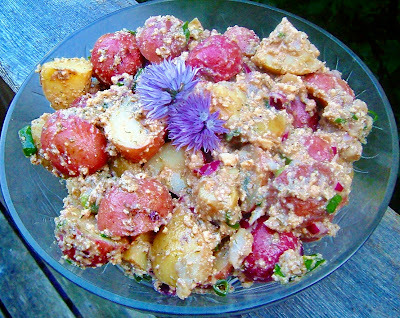 This salad is one of my favorite recipes from my book "World Vegan Feast", and a great one for any summer celebrations, picnics or potlucks. Happy Fourth of July to my American readers and friends! 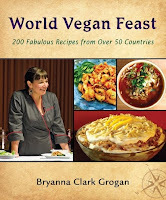 This recipe is from my book "World Vegan Feast" (Vegan Heritage Press, Woodstock, Virginia, 2011), and I have added some new information about cooking potatoes in this version of the recipe. This patriotic salad makes a delicious counterpart to your favorite vegan burgers (here's my latest version), or even as a light main dish. If you aren’t American or Canadian, you can simply use any kind of waxy, thin-skinned new potato wherever you are! NOTE ON COOKING POTATOES: Use waxy potatoes for potato salads, rather than baking potatoes. Waxy potatoes contain less starch and hold their shape better after cooking. Steaming is the preferable method of cooking, and also microwaving (instructions in recipe), especially for blue and purple potatoes, which I find tend to get mushy when boiled. Common white waxy potatoes in North America are round whites and long whites-- they have very thin skins. Gently scrub the potatoes, but leave the skins on. Leave the potatoes whole if they are very small nuggets. Otherwise, cut into 1-inch dice. Steam the potatoes over simmering water until tender, about 15 minutes. Alternative (and recommended for blue potatoes) directions: Micro-steam the potato chunks in a covered microwave-safe casserole. For 2 lbs potatoes, peeled, cut into 1-inch chunks, rinsed well, and drained, cook at 100% power for about 12 minutes. You do NOT need to add water to the casserole, BTW. Transfer them to a serving bowl. In a small bowl, combine the broth, oil, both vinegars, mustard, sugar, salt, garlic, and plenty of black pepper. Whisk together to blend well, then the Dressing over the still hot potatoes. Add the red and green onions, dillweed, tofu and vegan parmesan. Toss well to combine. Cover and refrigerate until serving time.